Q. There were some close games there, but overall it was a very solid performance from you. RAFAEL NADAL: It was a very difficult day to play tennis. A lot of wind, changing directions the wind all the time. No, sure was a positive victory for me. I did adjust a lot the shots today. But it was difficult to do it, very difficult. In general, I didn't have mistakes. After the two first games, especially after the second one, I didn't have mistakes until the second set. So, in general, very positive victory, no? I only had few mistake with the forehand with 3 1, serving for the match. For the rest of the match, I think was perfect. Days like today, the most important thing is win, and that's what I did, so very happy. Q. Were you surprised about Federer losing? RAFAEL NADAL: Well, always a surprise when Roger lose, no, because he's unbelievable what he did in this sport. But, you know, the day was difficult, I said before. That probably didn't help him a lot. The plan was good. Melzer play a good match. He probably had more mistakes than usual. That's sport. You win, you lose. Everybody can win and everybody can lose. Q. He said it was almost seven years he was not losing to any left handers, apart from you. Do you think this has something to do with his defeat today or just the wind? Melzer is left handed. RAFAEL NADAL: I don't understand all the question. Q. I'm asking if you think the fact that Melzer is left handed had something to do with the defeat of Federer today, or if the wind was probably more important? RAFAEL NADAL: Did you ask him? Because I don't know. I don't know. But I think if you said he lost against a lefty, because I beat him a few times on clay in the past, I think is completely different style of game, Melzer or me. So is not comparation [sic]. I think he lost because he didn't play his best today and his opponent played well, and the day was difficult. Q. 15 40, when you were serving for the match, you got out of trouble very well. Were you pleased with the way you managed to get out of that? 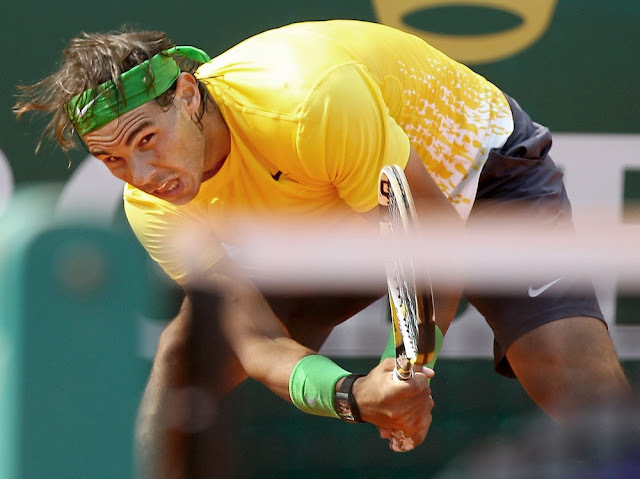 RAFAEL NADAL: I played too defensive at the beginning of that game. After that, with 15 40, it's true, I played two good points. With deuce, I played a very good point. Changing directions, finishing with a winner down the line with a forehand, that was the best point of the game. Positive save this. The breakpoints are decisive in a day like today. The wind is dangerous, and the opponent is dangerous, too, because he started to serve better and better at the end of the match. If I lost that game 5 4, I had to play the next two games against the wind, so I would be in trouble for sure. So was very important to save. Q. When it's windy, it's difficult for everybody to play. Do you think it's more difficult for people that have a flat game than your type of game? RAFAEL NADAL: No. It's easier for the players who has better movements, I think, no? Because when the wind goes crazy, the most important thing is don't to stop the legs. For the players who play a more static game I think is more difficult. Doesn't matter play flat or with topspin because with the topspin, when you move too quick, the hand is very dangerous the wind. When you play flat, doesn't affect that much the wind. That's what I think. Q. Do you feel stronger every day? RAFAEL NADAL: Yesterday I played well, I think very well. Today is difficult to analyze a lot the game. I think I did what I had to do, so I didn't have mistakes. But seriously, I didn't had fantastic feeling because it was impossible to have fantastic feeling. But I'm very happy about the victory. That's the true. Winning 6 1, 6 3 against a difficult player, he was playing well during all this tournament, is a positive result. He didn't play well. That's for sure. Ivan didn't have his best day. As I say, today was very difficult. Q. Can you tell us something about Melzer? You lost to him last year. What is your opinion on him and on his way of playing? RAFAEL NADAL: I don't know. I think he played well last year. I don't know how he started this year. The semifinals is a positive result. We will see. We will see what's going on. But his game sometimes can be really good and other times is not regular. But when he's playing well, he's dangerous because he play fast, he play with good serve, and very flat shots. Dangerous, no? He can go to the net. He can do dropshots always. Not easy to play against him, that's the true always.